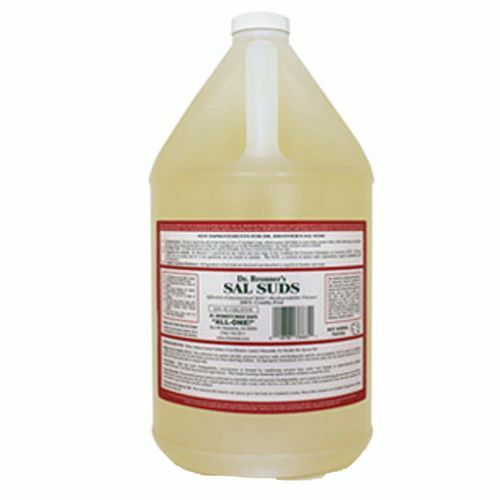 Sal Suds Organic Cleaner from Dr. Bronner is the one cleaner you'll keep finding uses for all around your home. Dr. Bronner's Sal Suds Organic Cleaner is made with plant-based surfactants and the oils of spruce and fir needles. This cleaner is not considered a soap, rinses cleanly and won't dry out your hands. This all-purpose cleaner is versatile enough to clean the surfaces inside and out of your home, including your laundry and dirty dishes, as well as your car. Keep your home clean the safe, natural way with Sal Suds Organic Cleaner from Dr. Bronner. Order it today from eVitamins and save big! Notes: 100% cruetly free. Not tested on animals. Ingredients: Water, Sodium Lauryl Sulfate, Coco-Betaine, Decyl Glucoside, Abies balsamea (Balsam Canada) Needle Oil, Tsuga canadensis (Spruce) Oil, Citric Acid, Sodium Sulfate, Sodium Chloride and Potassium Hydroxide. Directions: A few drops in a gallon of water removes all sprays from fruits and vegetables. One quarter ounce does a sink full of dishes. One quarter ounce in a basin of warm water cleans all your undies. One ounce in a pail of water will clean your house and car from top to bottom. For extra heavy jobs, cut it in half or use it straight. Pour some on a fabric stain and watch it disappear. The customer reviews posted below are based on individual consumer experiences and may NOT necessarily represent what expected results will be from using or taking Dr. Bronner's Sal Suds Organic Cleaner - 1 Gallon. These results may not be typical and you should not necessarily expect to receive the same results. Actual results may vary. Best all purpose soap for cleaning!!!! Love this product! It is a cleaner for almost anything in your home, including dishes (hand washing, not dishwashers), laundry (2 tablespoons for a large load) and you can even use it to rinse fruits and veggies (of course, diluted in water). The one gallon size lasts a long time.